Let Go of My Escargot! What was the Fruit that Adam and Eve Count Not Eat? If you were to visit Guerneville, California in the middle of March, you just might happen upon the annual Russian River Slug Festival. That’s right, every year thousands of Californians celebrate the qualities of the banana slug. This massive slug, that can grow to be about eight inches long, is one of the largest in the world. It gets its name from its bright yellow color, often speckled by brownish spots, that make it look like a ripe banana. During the festival, you might get to see slug racing, or be allowed to taste several deserts or drinks that use banana slug as an ingredient. In fact, the banana slug is so revered that the University of California Santa Cruz named this slimy creature its official school mascot. While most people think that slimy slugs are disgusting and gross, they may not know just how awesome slugs actually are. If I had space in this article, I might tell you about how some slugs, such as banana slugs, have thousands of tiny, razor-sharp teeth that replace each other in a similar way to shark teeth. Or I may choose to explain how, if a slug’s “eye” or “nose” feeler gets cut off, it just grows another one. Maybe I would inform you that some slugs live in the ocean, some live on land, and some live in rivers or lakes. And I might even let you know that slugs are a great source of protein for other animals such as toads, lizards, raccoons, and birds. But, alas, I don’t have that much space in this month’s Discovery issue, so I will only be able to tell you about one amazing slug feature—their slime! 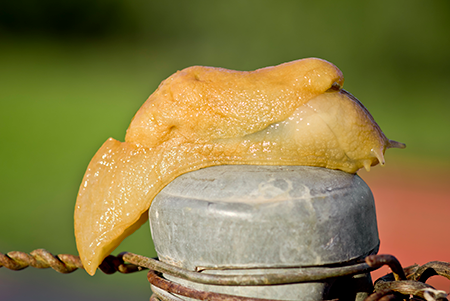 That’s right, it turns out that slug slime is one of the most remarkable substances in the natural world. Slugs use their slime for so many different things. The last time you touched a slug or saw its slime trail, you probably had no idea that you had come in contact with such marvelous mucus. In fact, most people dislike slugs because of their slime, but if they knew more about it, maybe they would appreciate God’s remarkable slimy slugs. Scientists have learned that slugs use their slime to keep from dehydrating, or drying out. They coat their body in slime, which protects them from overheating and losing too much water. Furthermore, they secrete a protective layer of slime onto the ground that allows them to travel over rough, harsh ground. Think about it like this. Have you ever walked across a very rocky area, such as a gravel driveway, with bare feet? If you have, maybe your soft little feet were pricked and hurt by the sharp rocks. Wouldn’t it have been nice to lay down a protective mat that was smooth and easy to walk across so that you did not hurt your feet? That’s just what slugs do. Their slime acts as a smooth barrier between their soft body and sharp surfaces so that they can go across practically anything. Also, maybe you have noticed that slugs can climb up very slick surfaces without falling. For instance, if you tried to climb up a smooth glass window that was 20 times taller than your body (let’s say it was about 100 feet tall), you would have serious problems. What would you grab onto? How would you pull yourself up the flat, smooth surface? You couldn’t do it. But thanks to slime, slugs have no problem crawling up such surfaces. By laying down their sticky slime, they can climb even the smoothest surface. And what is even more notable is that they can come down those surfaces without falling. What I mean is, suppose you were sliding down a long glass window. How would you stop yourself from crashing straight down? What would you grab onto to slow down your fall? You see, slug slime acts as a brake (like a car brake) that keeps the slug from sliding down the surface too quickly. Sometimes, however, the slug does not want to slide down; it wants to repel. In that case, slugs can turn their slime into a rope and, dangling in the air, repel off of a leaf or down a wall just like a rock climber repels from a cliff. Slug slime tastes bad, too. 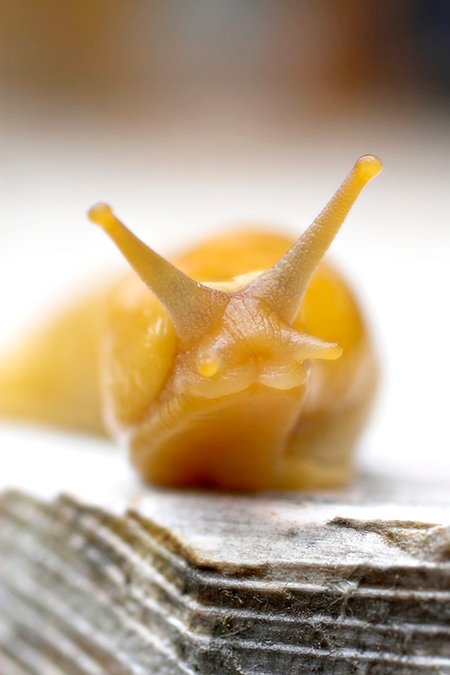 That is good for the slug, because when some animals try to eat slugs, the bad taste of the slime often makes the animal spit the slug out (but lots of animals fight through the bad taste to get to the juicy snack inside). 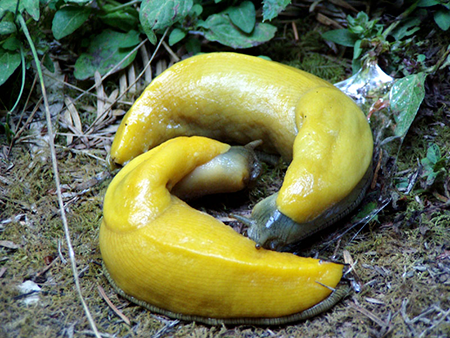 And some slugs, such as the banana slug, have a chemical in their slime that is an anesthetic (like the painkiller that a dentist uses) that causes the mouth of the animal that is eating the slug to go numb. Super slugs and their amazing slime could not have evolved over millions of years. Only God could design and create such a splendid, slimy, savvy, sticky, superb slug.